SALEM, Mass.—The City of Salem announced that all registered voters will be able to vote before Election Day for the first time ever in Massachusetts. Early Voting will begin on October 24, 2016 and continue through November 4, 2016. Prior to the enactment of this new law, the only way a registered voter was allowed to vote prior to Election Day was through absentee voting. Although absentee voting will still be available for registered voters who qualify, only those who will be absent from their city or town on Election Day, or have a disability that prevents them from going to the polls, or have a religious belief preventing the same, are legally allowed to vote by absentee ballot. Unlike absentee voting, early voting is for every registered voter. Registered voters do not need an excuse or reason to vote early. Regardless of whether a voter wants to take advantage of early voting, vote absentee or vote on election day, the first step is making sure you are a registered voter by October 19, 2016. To check to see if you are registered to vote, to find information on how to register to vote, and to see where you vote, you may visit the Secretary of the Commonwealth’s website at www.sec.state.ma.us/ele. If you need to register to vote, one way is to register online by visiting, www.RegisterToVoteMA.com. All you need is a license or an ID issued by the Registry of Motor Vehicles to apply online. To be eligible to vote in the November 8, 2016 election, you must register to vote or make any necessary changes to your voter registration (i.e. name, address, inactive to active status) by October 19, 2016. For public convenience, you will notice below, Salem has decided to offer night and weekend hours at certain locations. Also registered voters have the option to request an early voting ballot through the mail. Simply fill out an application and mail it to Salem City Hall, Election’s Office, Room #5, Salem, MA 01970. You can find the application on the Secretary of Commonwealth’s website www.sec.state.ma.us/ele. Please note, however, once a voter has cast an early voting ballot, the voter may no longer vote at the polls on Election Day. Whether you are Voting Early, on Election Day or by absentee voting, please note the ballots are double sided and include four (4) ballot questions. Please come prepared whether voting early or at the polls on election day to cast your votes and help us keep the lines moving. 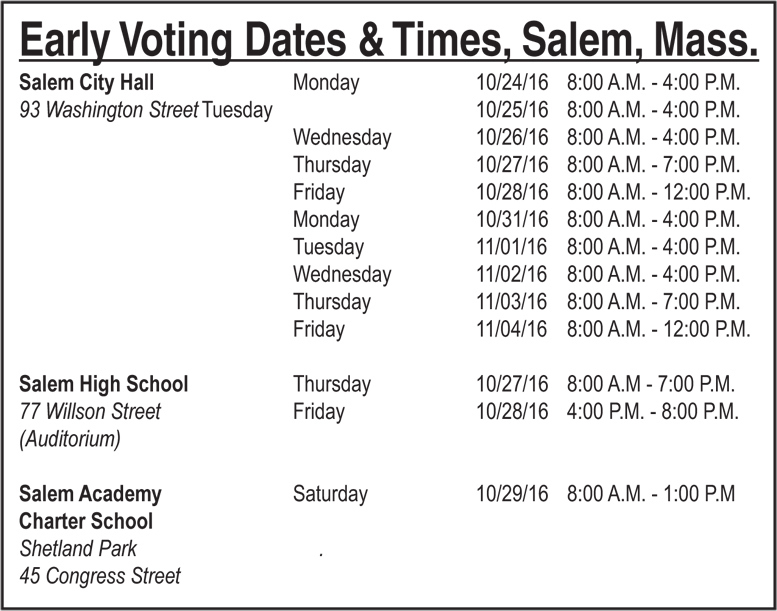 Be the first to comment on "Salem Early Voting Dates: Vote in Person or via Mail"